Not-intellectual-in-a-slightest action movie, which also gives no cyberpunk vibes, it’s rather a classic sci-fi thing about machines vs. humankind, and this one almost fully copies Terminator plot (good cyborgs help human rebels to stop other cyborgs from taking over the planet, they dropped the time travel though) and most likely was made after the success of Terminator 2 (they even brought the same visual effects specialist who made the cyborg in Nemesis to look and move exactly like in Cameron’s movie). 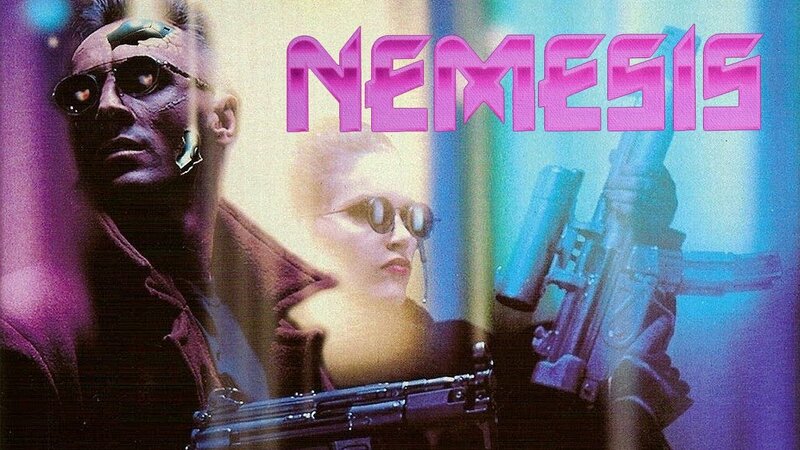 Although Terminator itself is nothing original, so I wouldn’t say Nemesis would be a rip-off of it, but I think the success of the T2 movie and hype around cyborgs at the time played the role. First thing to notice in the movie is how everyone can’t shoot properly at all, both “programmed to kill” cyborgs and “experienced” humans. They always miss the targets, even if they stand just about a meter away, it looks extremely ridiculous. But the movie gets even more ridiculous pretty quick when Shang Loo comes into the frame, becoming a unintentional comedy. Very serious poker-face men with black suits and black glasses chasing two humans and missing all the time even with some sort of a shotgun-grenade laucnher weapon (no sharpnel, no blast waves). One time this weapon shoots like it has nuclear bomb bullets, other time they’re like the weakest grenades, whatever fits the action on the screen and keeps the heroes going. The way Alex returns the card from cyborg makes him look like a Mowgli, not to mention the way he shoots their pursuer from grenade launcher making a flip, it’s just over the top. Truth to be said, they seem to embraced the ridiculousness they put on the screen, there’s a funny scene when a granny kills a cyborg with a gun she had in her purse. The movie tries very hard to look COOL, watching this on VHS being a teenager back in a day probably was a blast. The actors do their job just fine for a movie like that, it’s certainly not a disaster on the performance front. The editing is good, visual effects are great. The locations chosen for the movie are beautiful and they used very well, it’s one of the strong feats of the movie. You’d recognize Brion James, who probably played in all b-movies out there, Cary-Hiroyuki Tagawa, who later became Shang Tsung in Mortal Kombat, and Thomas Janes, who later became a great The Punisher. It was good to see them all here together.